Jack Vance is one of the elder statesmen of Science-Fiction writing, accurately described by the New York Times Magazine as ‘one of American literature’s most distinctive and undervalued voices.’ For over fifty years in a wide and varied career he has contributed enormously to the field of Sci-Fi with a rich harvest of articles, reviews, short stories and novels that even failing eyesight in the early 1980s couldn’t stop. A literate, inventive and playful spinner of tales his greatest works are probably the seminal ‘Dying Earth’ series (which in part spawned an entire sub-genre of ‘end-of-time’ stories in SF literature) and the epic ‘Lyonesse Trilogy’. 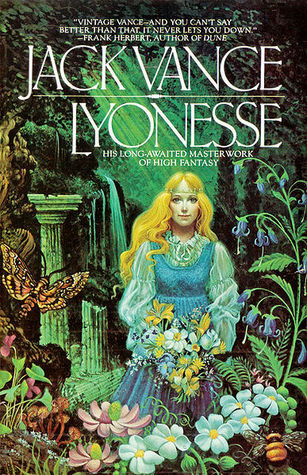 The latter series, beginning with the first book in the sequence, ‘Lyonesse: Suldrun’s Garden’ (1983), marked his entry into the field of ‘High Fantasy’ and for many defined it thereafter, more so in some ways than even the works of British master Fantasist J.R.R. Tolkien. Whereas Tolkien drew inspiration from Celtic, Germanic, Finnish and other European mythologies for his fictional creations, which he projected far back in time to some imagined ante-Glacial epoch of Western Europe, Vance took his inspirations closer to home and with a far lighter touch. Using the layered legends of Arthurian myth combined with its Irish and Celtic mythological antecedents he created a world set in an archipelago of fantastical islands off the coast of Medieval north-western France that had supposedly submerged beneath the waves of the Atlantic Ocean long before the modern era. These were the Elder Isles where the real and imaginary of early European history and legend mixed, living cheek by jowl in a cosmopolitan sprawl of kingdoms, principalities, dukedoms, fiefs and city-states. It was the history of Europe’s so-called ‘Dark Ages’ as it should have been rather than as it was and it was created with an artistic verve and imagination that left most other writers lying it its shadow. The story itself, told across the two follow-up novels, ‘Lyonesse: The Green Pearl ‘(1985) and ‘Lyonesse: Madouc’ (1989), is complex but rewarding, with Irish, Scots or Welsh readers in particular finding a rich crop of elements pleasingly familiar from our own histories, myths and folklores. It is neither too serious or too slight, striking a note of simple readability throughout that make the books a joy to consume and emblematic of Vance’s works in general. The entire trilogy is now available in a single hefty edition and is well worth purchasing to see how in the hands of a true and gifted writer the once tired clichés of Fantasy fiction can be given a new, and engagingly playful, life.